Jade has been treasured in China as the royal gemstone, "yu" for over 5,000 years. Jade was a symbol of love and virtue as well as a status symbol. Meanwhile, jade considered to possess the power of good luck, good health, longevity, and the ability to resist evil and disasters. Jade is the best meaningful and thoughtful present to any one in any occasion. At the same time, it's the best investment to pass on generations. The older the jade it is, the more value it increases. Market value of jade increases 20-30% each year, infact some researches found that good quality jade increases double or more. 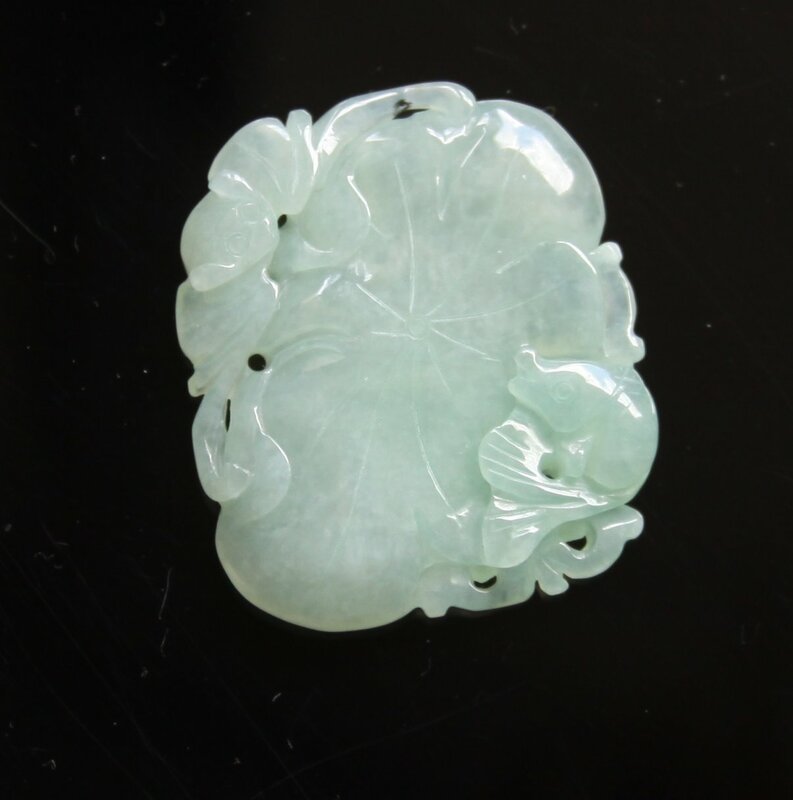 A grade Jadeite untreated Jade which has not been treated at all, non-enhanced, non-dyed. 100% natural in color, clarity and translucent. carving: carvings of a fish, monkey, and a lotus leaf. suggested retail $200.00. Don't miss this great opportunity to add this beautiful piece to your collections. Jadeite Jade divided in to 3 different grades in the market: A grade, B grade & C grade. The more transparency, more lively & vibrant color, less inclusions, the more valuable it is. the best jade is also called Jadeite which is 100% genuine mined stone (Jadeite) natural in color, translucent, and purity with out any treatment, nor enhancement, nor color dyed in any way. Nowadays natural color A grade jade are hard to find and these jade are the ones for investment and collection. In over ages, the color grain will grow and luster will become more shiny as you wear it long age. Its value would be increased by ages and generations. defines also genuine stone (Jadeite) and natural color but had been undergone with process of acid treatment to improve its translucent and remove impurities. called dyed jade which is B grade jadeite added in pigment substance. These are the least expensive jade in the market. Raw jade imported in the 90's or earlier. Item hand carved in China (Due to the thousands of years of jade history in China, China has the best jade workmanship in the world and no where else). Item is located in the USA now, so USA buyers not needed to worry anything about custom taxes. All photos are taken from actual object for sale.Chromatic aberration has been a most difficult problem for internet sale.Though we tried our best to take photos from the actual object, yet, sometimes the camera, different lighting and angle, optical fiber, monitor various reason still may form the picture and the actual object chromatic aberration.Please take the actual object color as standard. If you cannot accept these explanations, please don’t feel hesitate to e-mail us before purchase. The photos below are taken under natural daylight without any Photoshop colors enhance.Please read the above facts regarding the photos colors.Jadeite color also may look different depends on the actual lighting and angles viewing the object. Item can be returned for refund or exchange at no question ask. Refund will be full refund less shipping and insurance fee. Exchange can be any item by adjust credit back or pay the difference excluded shipping and insurance fee. Insurance is not required but strongly recommended because it's buyer's responsibility for item is lost or damage during the return shipment. Refund or exchange will be given only item is received by us in original condition. Thank you!